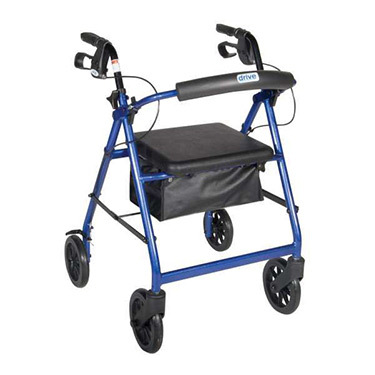 This popular rolling walker by Drive Medical has large 7.5 inch wheels allowing it to work great whether you are indoors or outdoors. It's loaded with features, including a large padded seat and backrest, and comes in red and blue. Removable, hinged, padded backrests can be folded up or down as necessary. Padded seat with zippered pouch under seat. Handle Height (highest): 38"; Handle Height (lowest): 33"
Seat Depth: 14"; Seat Width: 14"; Seat Height: 23"
Great quality product and would highlyrecommend. A decent product for the money. Around the house this product is OK, but when you walk on a flat surface with it inside or outside, you discover in a very disturbing way that only three of the four wheels are actually on the ground! The fourth wheel will "Dig in" when you come to almost any uneven surface, and that is not really safe, as it tends to spin the Rollator sideways. Pros:I really like the light weight and the wide seat. Cons:It does not set squarely on a flat surface.